Is your sales team not delivering the expected results? Are they complaining about work overload, too many or not enough leads? Is your customer profitability constantly getting lower? Chances are, your sales people are spending their time with the wrong customers. But stop! Don’t just blame your salesmen. It’s far more complicated than that. Many sales people I know handle each lead equally. After all it’s a potential customer, right? Everybody deserves their full attention. Wrong! Ask yourself a question: Should they have received this lead in the first place? Sales people (in particular field sales) are far too expensive to spend their time with the wrong customers. But also how they spend it (the sales processes) is important. Let’s first look into sales activities: On average a typical field sales force spends 70 – 80% of its time with existing business. This leaves less than 30% for new business, cross or up selling. But only this can help to grow your business. If you also consider it is 10 times harder to convince a new customer than selling to an existing one, it leaves only about 3 – 5% effective time for new business. In addition you cannot retain 100% of your customers. However hard you try, some will inevitably leave to the competition. This is why many organisations struggle with their numbers, grow slower than expected or stop growing all together. But that is only one part of the issue. Further to the above many businesses focus on the wrong customers, the wrong topics or do not differentiate their sales processes. Or even worse, they don’t have any defined and formalised. Sales success still seems to be the result of particularly gifted sales people, which is hard or impossible to replicate. But again, stop blaming the other 90%. Sometimes the only difference is, that the magical 10% focus on the right, because more lucrative customers – sometimes even completely ignoring the ‘wrong’ or ‘bad’ leads. Seemingly more successful at first glance, they waste expensive leads. But again, should they have received all these leads in the first place? 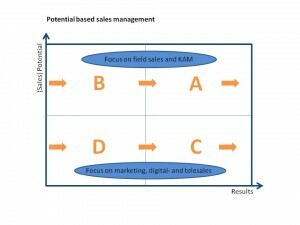 It is time to create a more strategic approach that removes the ‘black box sales’. For that we have to structure our customer base differently and define effective sales processes. 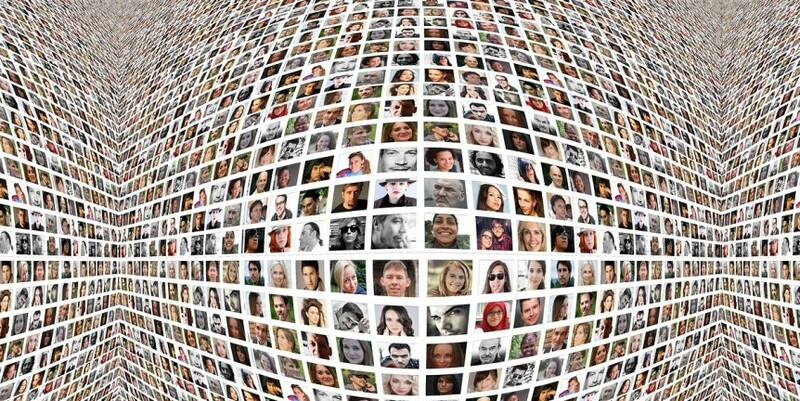 Let us look at this approach step by step and start with the customer segmentation. For this, first think about your ideal customer. How much is he able to buy? Is he able to influence others and recommend your services? Do other companies follow or copy his decision? Now, consider the potential, existing and new customers have, based on this model. Finally we have to group them into high- and low-potential customers. This forms the y-axis of our customer matrix. Next we group our customers based on the existing result we already achieve with them. Think about revenue and your share of this customer in your product category or market segment. How much of the potential have you already realised and achieved? Again we group customers in high and low results on the x-axis. Every customer (new and existing) now sits in one of four segments. Now we have to look closer into sales processes. Depending on the industry there are usually four: Existing business (how to manage the transaction of repeating orders and keep customers loyal), up-selling (selling existing customers more of the products they already buy or some add-ons), cross-selling (selling existing customers entirely new products or products they don’t use yet) and finally new business (winning completely new customers). We need to differentiate these processes by customer segment and decide what process is relevant, how it should work and who should do it. In general customers with high potential (A and B) should be covered by Business Development, Account and Key Account Management. 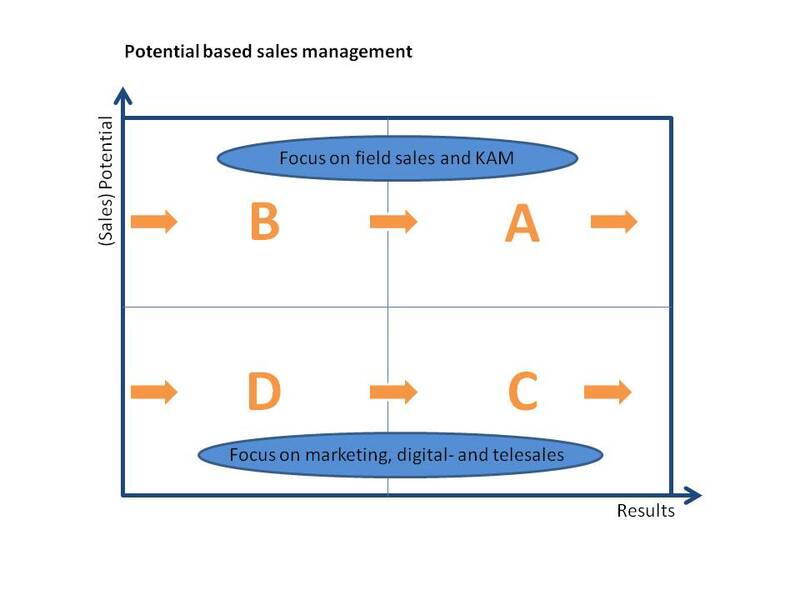 Those with low potential are the field of digital and tele sales (like online-shops, call centres) or depending on the industry, distributors and resellers. The main advantages of this approach are manifold. To name only a few: First, it is much easier to differentiate, calculate and describe sales targets based on processes and customer segments. Second, you can plan your sales resources and allocate them to different tasks much more accurately. Finally it gets easier to plan, execute, control and benchmark targeted Marketing support. Also, this look at the big picture allows you to answer questions like: Where is my biggest growth potential (new customers, new products)? Do I need to enter new markets and if yes, which? How can I generate a maximum of results with a minimum of investment? Please let me know your thoughts and experiences and don’t forget to share this with your network if you think it could be helpful and interesting. Need help to implement this model in your business? Get in touch!